Maybe there's just a feeling something is missing. It's hard to pin down, difficult to articulate; a matter of lying in bed at night, kept awake by a mysterious yearning for more Wallace Stevens quotes set to low-down combustible grooves. Maybe it's a sudden desire to hear words like 'myxamatoid' and 'spraddle' deployed in popular music instead of the usual galaxies of moons and Junes, or a craving to listen to songs that coerce the ghosts of Marilyn Monroe, Valerie Solanas and Harry Houdini into interesting new poses. 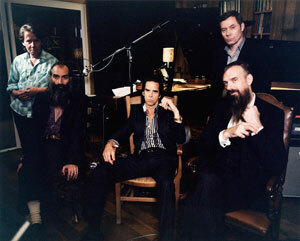 Or maybe it's just the instinctive knowledge that it's time for a new album from Nick Cave And The Bad Seeds - who else can be relied upon during days like these. That's no understatement. DIG, LAZARUS, DIG!!! is elusive, allusive and - what the hell - illusive, a dizzying narrative that unrolls Western civilisation from Homer to Freud, the Bible to the Beats, fitting in its own cast of mythical characters along the way. Little Janie and the sinister Mr. Sandman lock into a grim dance on Today's Lesson, a blast of sexual politics crammed into one nasty rock'n'roll fable; the roaming spirits of Albert Goes West go on an interstate rampage through psychotic episodes and dive bar beers; while poor Lazarus finds himself lost and alone on the title track's dense compression of New Testament miracles, Victorian spiritualism and New York decadence. Then there's the pyrotechnic rant We Call Upon The Author (To Explain), which subtly and self-mockingly sets Cave The Songwriter in the dock, challenges God to account for himself and sets a literary feud ('Bukowski was a jerk! Berryman was best!!!') to an irresistible beat. DIG, LAZARUS, DIG!!! - the punctuation is another blow against linguistic dullards - was recorded by Cave, Mick Harvey, Warren Ellis, Martyn Casey, Jim Sclavunos, Thomas Wydler, James Johnston and Conway Savage at London's State of the Ark studio. It's owned by Terry Britton, the man behind the Tina Turner hit What's Love Got To Do With It As it happens, the answer is 'not a lot'; instead, DIG, LAZARUS, DIG!!! is partly the result of Cave's desire to escape his quest for 'the classic love song' and explore more abstract emotional territory. The piano has been pared back, the band primed to be vigilant for those chords that were too easily pleasing, too obviously emotive. In their place come loops and static, textural distortions, slow-creeping atmospheres. At times, the vocals have a deliberately dispassionate air, at odds with the furious intensity or wracked emotion often associated with Cave. It's an approach influenced by recent film soundtrack work, including Cave and Ellis's score for Andrew Dominik's The Assassination Of Jesse James by The Coward Robert Ford. 'What you don't want in a film is to have a sad scene and then in come the weepy violins', says Cave. 'I think we were looking for a little more musical neutrality. Manipulation by stealth. Music that takes a little longer to absorb, before the penny drops'. This is suggestive, subtle and utterly seductive music, testament to the seriousness of the project to find new ways of moving forward that started with 1984's first post-Birthday Party record From Her To Eternity. Yet it started as a revisiting of an old plot, a desire to make a largely acoustic record that originally raised its head with 1992's Henry's Dream. In between this multi-layering is the space for Cave to narrate and curate the human condition. Yes, despite the shunning of the 'classic love song', there is at least one that couldn't be shaken off - Jesus Of The Moon, a magnificent ballad that can stand alongside Into My Arms and The Ship Song. 'I couldn't just consign it to the garbage bin,' shrugs Cave. Elsewhere, though, it's not about grand gestures and grander passions but those queasy, muffled states that rarely find their way past the sharp physical certainties of rock'n'roll; apathy and disorientation, complicity in your own oppression, mental static and psychosexual feedback. There's Moonland, one man's personal nuclear winter; Night Of The Lotus Eaters, where global chaos filters in through the bandages and blinkers of self-indulgence and complacency; the masculine self-delusions of Hold On To Yourself; the ghastly posthumous party of More News From Nowhere, peopled by demons called Deanna and a realisation of your own obsolescence.